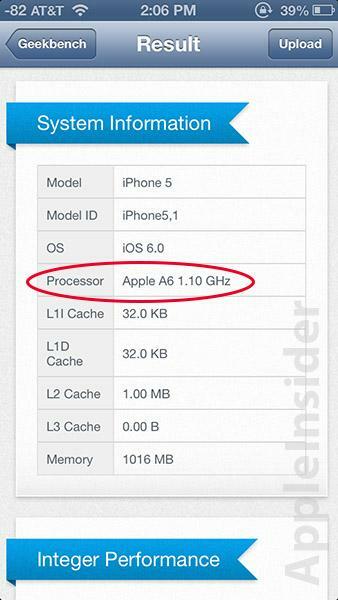 When the sixth-generation iPhone was released last week, reviews noted a substantial boost in processing speed compared to last year's iPhone 4S, mostly due to Apple's new A6 SoC. At the time, the chip was thought to be clocked at around 1GHz, however a new benchmark using Primate Labs' Geekbench for iPhone shows a consistent clock speed of 1.3GHz. Primate Labs' John Poole told Engadget that the latest version 2.3.6 released on Wednesday provides more accurate CPU reporting as a result of an improved processor frequency detection algorithm. "Earlier versions of Geekbench had trouble determining the A6's frequency, which lead to people claiming the A6's frequency as 1.0GHz as it was the most common value Geekbench reported," Poole said. Initial reports found on Geekbench's online device log, presumably from a reviewer testing the handset's prowess, showed the handset's CPU to be twice as fast as the previous A5 series despite being clocked at 1.02GHz. The relatively low clock speed prompted speculation as to how Apple managed to squeeze out the dramatic performance improvements, with theories ranging from new memory handling methods to a totally redesigned core. Coming on the heels of Wednesday's discovery, some publications have reported the A6 as having the ability to dynamically overclock itself during CPU-intensive situations, however Poole disagrees with the hypothesis. 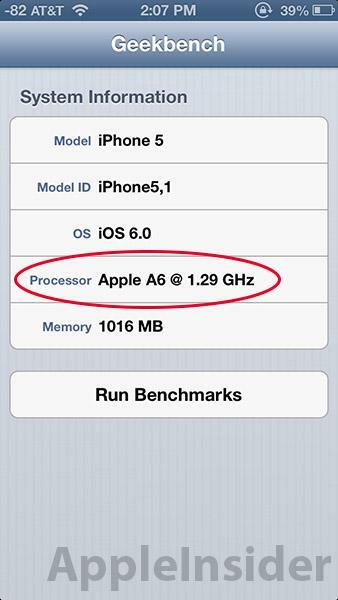 "I don't believe the A6 has any form of processor boost," Poole said. "In our testing, we found the 1.3GHz was constant regardless of whether one core or both cores were busy." 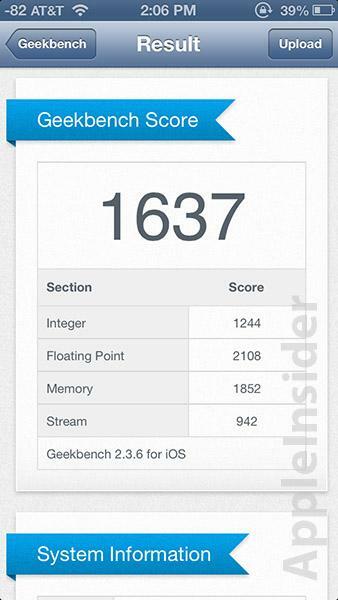 To confirm Poole's results, AppleInsider tested an AT&T version of the iPhone 5 with Geekbench 2.3.6. Curiously, the first run pegged the A6 at 1.10GHz, though after killing and reopening the app, the software reported a consistent clock speed of 1.29GHz. The A6's dual-cores were in fact designed in-house by Apple and feature a "manual" layout that is said to be faster than computer-constructed counterparts.